In late 2009 I had the opportunity while visiting friends north of Toronto, to take a detour on a sunny afternoon over to Hamilton and a little place called Mr. Used. To many this is the first they have heard of Mr. Used, yet not the first time they have seen it. Mr. Used was the longtime supplier of all the gadgets and tidbits used on the Red Green Show. 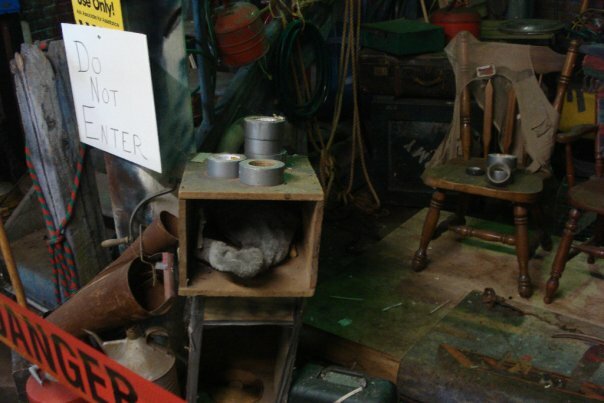 At the conclusion of the series, the sets were in peril of being discarded or re-used as there was no use for them anymore in their current state. This is very ironic as the RGS sets themselves were re-used from Smith and Smith when the show ended. Since RGS was the next project for S&S Productions, they recycled the old ones as a great time and money saver (When it started, RGS was done with as small of a budget as possible). This fact can still be seen when checking out the rear of the remaining sets in existence, as you can clearly note where "Smith & Smith" is marked along with other notations from both that show and RGS. 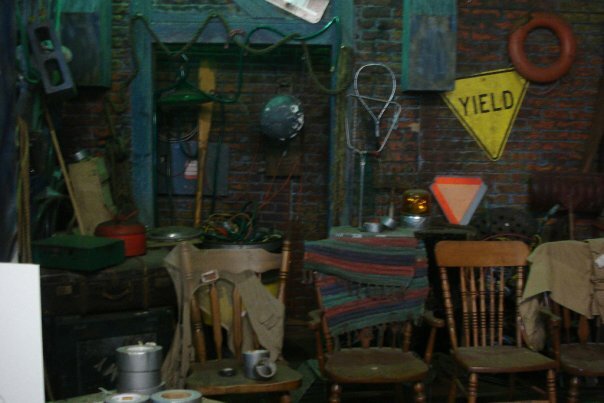 Speaking of the remaining sets, the fine folks at Mr. Used were able to get most of the sets from the show and have dedicated a part of their business location to the preservation and display of the sets. Here are some pictures of this display. Despite the efforts of Mr. Used, there are currently several sets which are unaccounted for (at least I haven't been able to find out what happened to them). Formerly at Mr. Used, The basement of the lodge, a hallway and Red's den are present. The following is every other set that is unaccounted for. 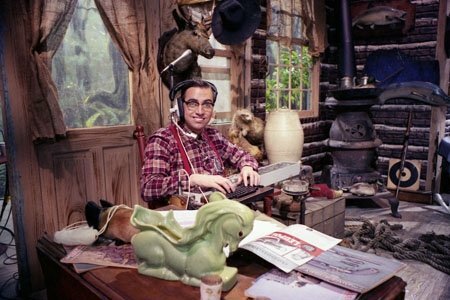 Ranger Gords' Fire Watch Tower (Seasons 8-15): In the later seasons, Ranger Gord would be found in his tower. This of course was a set created and films at CBC's studios in Toronto and not the Ferndale tower (see here for more). 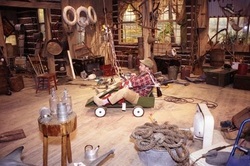 The set was very similar to the layout of the Ferndale tower, however with less "everyday" items that one would expect to find had it really been inhabited. The background had random branches and the standard blueish hue to stand for the sky.The whereabouts of this set remain unknown since the end of production. New Lodge Foyer (CBC): This is the main area of the lodge where the show was primarily filmed and was changed in 1997 slightly with the move to CBC. There is a door to the outside on the right rear of the room and across from that to the left is an entrance to the basement stairs. This entrance is brought forward and facing the camera directly instead of facing the door outside as in the earlier seasons. It also has a bar/island with a sink to the immediate right of the screen where there is also a fair sized window. The window is square and the top cuts out from the main wall similar to an awning. Directly to the back there are two large sized picture windows with the exterior of the lodge (mostly trees). The exterior also is noted to change depending on the season the episode is set in (snow on background if winter). The colour of the walls are noticeably different as well, as it is a lighter brown in the newer seasons. In the earlier seasons, the wall colour is a dark brown. It is unknown where the foyer set is currently. Speculation is that it was recycled for use on other projects. However this is unconfirmed and it is possible it is still sitting in a warehouse or storage facility either intact or in pieces. Original Lodge Foyer: The original set is generally the same layout as the CBC one, however it has minor differences. From the main camera angle, there is a door outside to the right rear of the room and directly across from that to the left is an entrance to the basement stairs. This changes in the later seasons. As noted above, the wall colour is a dark brown which changes from the later seasons as there is a light brown colour to the walls. Beside the main exit of the foyer is a large picture window. This window is straight with a curved top. To the direct left (beside where Harold normally stands) there is another, smaller window (can be seen in Season 1, Episode 10). It is believed that during the switchover to CBC, the original foyer was remodeled rather than scrapped, however that is unconfirmed. Opening Hallway: During the first 3 seasons of the show, the camera would open the show by slowly moving up a hallway in a zig-zag pattern, while Harold would start the opening. This hallway had a picture board filled with pictures of the lodge members (and crew members from the set if you zoom in enough) which is on display at Mr. Used. Like the rest of the lodge it is filled with junk (most notably a white boating ring). After the 3rd season the starting was dropped and this hallway was never seen again. It is presumed it was scrapped altogether and does not exist today. It is also believed that this hallway connects the foyer with the living room of the lodge. Living Room: Seen only in season 2, this large room looked more like an addition to the lodge or a large sun-room. It was distinguishable by having two doors to the outside (one facing the dock to the left of the camera and one facing the driveway to the lodge to the right of the camera, as noted in several season 2 episodes). There was a poker table to the left of the room (Shown occasionally during the opening credits with Harold sitting at it in Season 2) and a couch and easy chair directly in front of the camera with a beam behind it. Behind the couch was a collection of junk and a 1950's style Coca-Cola floor cooler (Red grabs what is believed to be a can of Canada Dry Ginger Ale from this cooler in one Season 2 episode). Behind the camera angle was a hallway (believed to be connected to the foyer) and is only seen once when Red gets up to leave. This set was also believed to be recycled and does not exist. Harold as shown during the opening credits in season 1 in the Lodge living room. Lodge Backroom - In season 1 Harold would often be given time in the show to discuss things that were of concern to the younger generation. This would normally be to the disgust of Red who would sit in from of him and stare on. This room had a door to the left of the camera angle beside where Red would normally sit. Behind Harold there would be a small window. The rest of the room was filled with junk. This room has also disappeared. But due to being only in season 1, it is assumed it was cannibalized for another set. 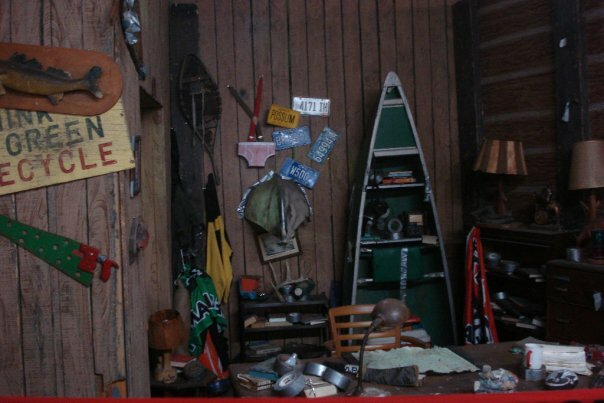 Lodge Basement - While you can find the basement of the lodge at Mr. Used (as shown above), this is believed to be set up from the later seasons of the show. If you compare season 14 and season 2 for example, there is a distinct difference in the sets. To show this, there is an extended area behind the stair well which houses the lodge water pump (especially noticeable in Season 2's Broken Water Pump). It is clear from the old episodes that this area is approximately 4-6 paces (4-6ft) long which makes sense given the size of the pump. However at Mr. Used, the display only gives about half of that amount, meaning this was changed during the shows run. Further evidence can be found on the later seasons during lodge meetings where the pump is not visible at all. Past that is a doorway and another back room of the lodge (believed to have an alternate exit from the basement). This part of the set is big enough to walk into and around, whereas the set on display at Mr. Used is very tight and not easily accessible. It is unknown if this was accurate to the set during production or was apart of the set being put on display. The same can be said for some of the other props. Most notably is the large Possum Lodge Chapter 13 crest which was on the back wall of the basement. This is not present at the current display and it is unknown where it is today. It is believed that the basement was changed occasionally over the series, and like the foyer, saw the biggest changes after the show switched to CBC in the late 1990's. Everyone knows Handyman Corner. It is partly what made RGS into the cult classic it is today. 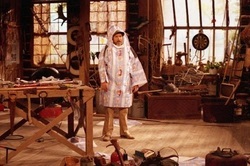 Red spent most of the first 5 seasons hidden away in his workshop working on various projects to show on his segments like the fire extinguisher dragster (The Road Hogg) to the tablecloth raincoat to the CD drive from a toaster. However as the show moved along, there were bigger and bigger projects which required new locations (generally outside around the lodge). That said, the workshop itself was easily identifiable since it appeared to be an old sun room or common room in the lodge. The camera in the early seasons would pan in from an outside hallway and through a doorway where Red had a solid, 10ft long (OK so I made an educated guess based on comparing Red's height to the table length) workbench. To the back were two windows similar to the foyer of the lodge and a large, rectangular sun room style window with appeared to protrude out of the wall towards the outside of the lodge. Through the glass we could faintly see images of trees and dirt. To the very left and beside the windows was a door which we understand leads to the outside. It was on an angle, again similar to the left hand door at the back of the lodge foyer. The floors were the standard wood like most other rooms in the lodge, plus it was loaded with junk as well. So what happened to the workshop? Well no one knows for sure. To my findings, the workshop was last seen around 1995/1996. Because this was 10 years before the end of the series and in the middle of moving from CHCH to CBC, it is believed that the set was gutted and destroyed. A shot of Red in the shop with a good view of the back windows. Red with the shop cleared out to launch the Road Hogg. Here you can notice the back door as well as the open section to the left of the camera.